With a life long knowledge and avid interest in antique furniture, Alison decided to take a leap from hobby to career and trained as a French Polisher in the mid 1990’s. 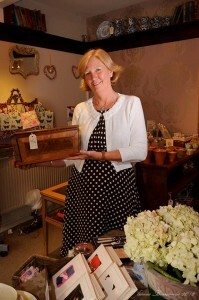 This enabled her to establish Cobweb Antiques in 1998. Initially, furniture was sourced, restored and sold only to the trade. Then in 2000 an opportunity came to take the business to the next level and open a retail shop in the picturesque village of Slaithwaite. Over the years our business has grown and evolved. The core specialism is steadfastly antique and vintage furniture but we offer the complimentary services of restoration, French Polishing and upholstery. We also have a wide range of carefully selected accessories to grace your home; from cashmere throws to lavender filled hearts. Cobweb’s ground floor showroom offers a frequently replenished selection of antique furniture, beautiful soft furnishings and irresistible home accessories. You will also find inspiring gift ideas or personal treats including jewellery, scarves, books, ornaments and lovely greeting cards to complete a perfect present. Cobweb provides a personal and dedicated consultation service and with our help your faded or damaged antiques are restored to their former glory with our full furniture restoration service. The classic styles of vintage arm chairs and sofas can also be transformed with new upholstery and trimmings. 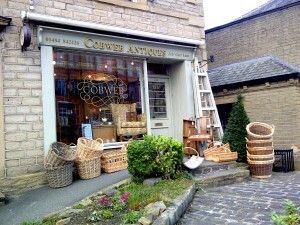 Being centrally located in the village of Slaithwaite, a visit to Cobweb can be combined with a stroll along Huddersfield’s narrow canal and a stop for lunch or refreshments in the cafe located just next door. Slaithwaite is a village approximately 5 miles south west of Huddersfield. It is situated in the Colne Valley across the river Colne and the Huddersfield narrow canal. It is a thriving village with an assortment of unique independent shops including a hand made bakery, an artisan ice cream shop, and lovely eateries and wine bar. Slaithwaite is famous for its Moon Raking Festival which is held biannually in February.